Van Badham on the 2013 elections: There's little doubt that Rupert Murdoch's newspapers deliver prime ministerial victories in Australia... But that these backings at their most fervent can now only deliver a 1.2% is yet another suggestion in a broader dialogue that the days of the political influence of old media may be numbered. 3) 2 cups of coffee. (2. not 1. Not 3. 2 shall be the number of cups to be consumed, no more and no less. 5) No sensible food for four hours. The downside of this is feeling immensely ill once you *do* finally eat something sensible. But I have five rewritten pages of a chapter 4! 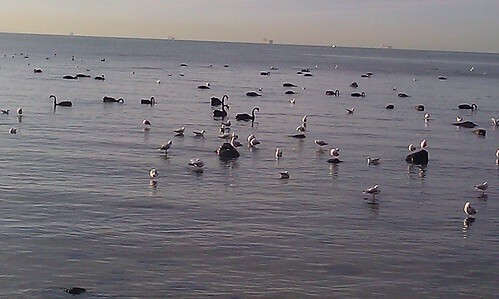 There's an immense flock of them, about a hundred swans feeding everyday in the bay area. On a grey day, they look like capail uisce, something fey and very wild and not serene at all. Briony and I spent a quiet morning in our new flat, after a weekend of entertaining family. My Mom had flown over for the weekend and we finally got to have her stay over and cook for her: roast chicken and vegetables, drunken pears with chocolate sauce. All of it Briony's doing (thank you dear heart). I think Mom adored it---adored the beach, adored the quiet, and the blue water just a five minute's walk away from our house. The neighborhood Briony and I live in is very different to the places we've chosen to stay it for most our adult lives.There are so many wild things outside: ibis and pelicans, egrets and seagulls diving for fish. It's been a mad beginning to the year with the move. It feels good to have this. In which Elaine finishes a novel and tries to be human again. So as of this afternoon, 84,500 words later, I've finished the 2012 edits of The Disappearance of Rafael Panaligan. *collapses in exhaustion* I...I hope this this will be the start of me learning to be human again, and not a hermit. Mom and Dad flew in after there Continuum weekend to celebrate my 28th birthday with me. These visits are often a cause of stress and anxiety, because there is a prerequisite that daughter spends time away from Briony, and in this particular visit, Mum and Dad insisted on visiting house, meeting Carlos and Esther for the first time and could not give a specific time for when up until the day. And Briony and me with a messy, messy room because we are terrible at keeping things neat and because the girls don't help much either. Stress, stress all around. There's also an extent to which I feel...so many things I wanted to do by age 28 that have been left undone. Have The Disappearance finished, published, with more brain children on the way. Finished, or at least, be en route to a PHD, even though I'm not sure I want academia to be my life anymore. Have learned to be braver, not to worry so much whether people liked her or not, to not worry to be the brightest, wittiest and prettiest in the room. To be someone worthwhile instead, a better wordsmith, a better theorist. Something concrete for them to be proud of and I never feel that I've measured up to the things I should or want to be and somehow all of that is magnified whenever I see my family. So means a great deal, when Mom squeezes my shoulder to say how happy she is with what I've made for myself, that I am happy. That I have Briony, that I have my friends, the girls, though she and Dad are still }: about rats. That she and DDad want to see my next short story. And I look at the things I want to do and the things I could be and think yeah, I can still do that. Tying my hair back in writer's bun. So...uhm, after five wonderful days of public holidays (six for me \o/), I, and many of our colleagues walked into work and...found ourselves swimming in books. Oceans of books. Mountains of books. Infinite galaxies and constellations of books. Our only consolation was that out there, somewhere, all of our fellow librarians in public libraries were going through the exact same thing. I think we were all a little starry eyed when we finally walked out of work. And then I got home and found that my author interview was up on Rocket Kapre. Because I am an idiot and forgot to tell everyone: guys, I lost my phone over the weekend and am currently uncontactable by mobile. ;__; Briony and I hope to resolve that this weekend, but until then, email, lj and dreamwidth are the ways to go. I think friends have B's mobile, so if you need to ping us, ping Briony. Fare thee well fantasywithbite. Once upon a time, I friended the comm out of a desire to check up on awesome books that I might otherwise be missing out on. But of late, you've become fonder and fonder of vitirolic reviews. You seem to believe the amount of venom you spew is equivalent to the amount of smart and awesome that is you. It's...not, really. It makes it very difficult for me to engage with any valid argument you might be trying to make. People who have tried to explain this to you, or disagree with you suddenly find themselves within spitting range. I don't know why it's taken me so long to defriend the comm (actually I do. What with househunting and keeping me and my darling fed and presentable for work, there has been precious little lj time to read my f'list), but for the sake of my blood pressure, I'm glad I have the time to do it now. When I came home, Briony insisted I had to sit down and watch this with her. I was hesitant, because I remember watching Cardcaptors, the English dubbed version when I was a kid, and not being very impressed. It was Pokemon for girls --- which just goes to show, you can never, ever judge an anime from its English dub. Both Pokemon and Cardcaptor Sakura were horribly mangled in their English translations: scenes and entire episodes cut and spliced so they could be marketed to the translators' ideal Western audience --- Pokemon for younger children, Cardcaptor Sakura for the boys. Of course, as we all know, boys can't deal with girls in the spotlight, or the idea of other boys who like each other. So! Snip snip. Am back in Melbourne. My Briar Rose has gone to work, and I have most of the morning and a little of the afternoon off. A bare, but welcome reward in exchange for a Saturday shift. Spending time, cuddling the girls, feeding girls, reading Jennifer Potter's The Rose: A True History checking up on f'list and the net. I hope the new years is treating you well. <3 I...am sorry I was so incognito last year, didn't talk to you guys that much, and reciprocate the kind of support you guys gave me when I was doing NaNo and when The Disappearance was being an evil brainchild. And as much as I know it was a combination of things: Sofie's illness and the constant fluctuation between OMG SHE'S GOING TO DIE and oh she's okay. okay. ; coping with my social anxiety and stress People have been kind and awesome about it, so I am grateful of that, if cranky at myself for not being better. So for the New Years, I am writing a list, a very Important Obligatory List for the New Year. 1a) understand when you need a break from the damn book, and for the love of God, take it. 2) Spend more time with friends, online and offline. And on that note, Skype your family more often. 3)Be more disciplined and less scattered. It's no good getting up at 5:00 only to give the girls their medicine, give them conciliatory treats and then realize it's 5:30 and you only have 30 minutes to go. And no reading F.A. McNeil's The Heart's Landscape (alas, no longer online) just because you feel stuck and hoping someone else's gorgeous work will make you feel less so. 3a) Work out what you need to do in the space of the one hour you've given yourself. Or you will spend much of that one hour flailing. 4) Eat less take out. No seriously Elaine. Less take out for you. 4a) It doesn't matter how awesome roasted chicken is. No. Just no. 5a) on that note, read more sf online fiction, period. *falls over* this is all manageable, yes? First, Happy New Years, friends. <3 May all your New Year's Resolutions bear fruit. So after a long, long flight, I am back home in Manila with my family, and without my Briony. ;_; We had a somewhat celebratory and sad making last evening together on Wednesday---nomming Roast chicken and chips, and watching the West Wing, which to my surprise and delight, Briony enjoys. Unfortunately, rewatching it again, it is more headdesky than I remember (Why yes Toby. Insulting the president of Indonesia would be a Good Thing when you were planning to ask one of his senior aides for a favor was a stupid thing do, why do you ask? ) and there was that sad Christmas episode where Mrs. Landingham talks about missing her sons, a sixteen year old gay kid died, and Toby talked to a dead Veteran's brother, and we were all: D: D: D: And cuddled each other and Alice and Sofie, who did not understand what was wrong with Mums. It was...odd...walking into the house, into my room, with all these familiar things --- my cabinet of books, my owl and stuffed animals -- and remember that I haven't seen them for more than a year. It's wonderful and strange to be back with my family, in the house where I grew up. And being back here --- I'm glad I did come back. I am still sad that my Briony is not here -- I hope there will be a time when she can fly back with me. 0bake and I are having it early this year, on the 18th. It would be super awesome if you could come. There will be loads of food (you don't have to bring a plate, but if you want, bring a bottle) and good company and things on the TV and possibly games if we can get ourselves that organised. We will start at 1pm with A Lunch and there will also be A Dinner at around about 7-ish, so if you can't get there at the start or can't hang around the whole time, don't worry, just pop in and out as you wish. We are going to make the most of the space we have, but if you have, say, a foldable chair you can bring along or even a good floor-sitting cushion, they would be welcome. Ok guys. This time, I have no Sunday afternoon shift to worry about. \o/ SO. Who'd like to come see Harry Potter this weekend? We are humbly suggesting 6:40 on Saturday night, or otherwise, Sunday early afternoon (11:20 or 2:10). In other news, Sofie and Alice are being cute with a paper bag. Briony and I would like to submit a modest proposal. Who would like to come and see The Deathly Hallows Part I with us this Saturday night at Nova cinema? (we're thinking of the 6: 40 pm showing). The more the merrier---I know some of you are up to your necks in work/stress. A few hours with friends and an escapist franchise might be what the doctor ordered. Shout out to friends near and far, NaNoing and not-NaNoing madly away. ow are you guys? Briony and I would love to catch up with you at some point, if you need a break or two from NaNo (we humbly submit that we would love to see the new HP movie with a huge group of You), or if you are very determined, and would like a write in with caffeine and company. <3 I am not doing NaNo, but I am frantically editing The Disappearance and would love a write in. It is also an apology for not being around as much as I have. Sofie has been ill---and it's been a mad couple of weeks. Not just dosing her, but frantically trying to pin point what might be setting off her attacks or aggravating her illness---dust, a cage that was cleaned only the other day but isn't clean enough, our laundry detergent, something lacking from her diet. Sofie was prescribed doxy from the vet, and since then, she's better, and then not-better, and at the end of the two week round of her meds, when it was clear that it wasn't going away, we switched to the Kensington vet, highly recommended by lovely and sensible friends, and took Alice, who'd been sneezing a little. The good news was that Sofie and Alice were both gorgeous and healthy. The bad news was, the vet was freaked that the meds hadn't taken care of Sofie's respiratory problems. They worked out that it might be the SDA virus, not mycoplasma, that might be the cause. She ordered in the appropriate meds, for both Alice AND Sofie, since in all liklihood, Alice had it too. The long and short of it: Sofie looks like she is on the mend. :) She's seen the vet yesterday, her chest sounds clear and her condition quote, is excellent. Our little girl, so much source of exasperation, hilarity, affection and distress, is currently wrecking mischief with her sister. Usok # 2 is out, and "The Widow and the Princess of the Dwende", my NaNo that turned into a short story, is up. Thank you to Paolo Chikiamco, who picked up the story, and who has been awesome and patient throughout the whole, massive editing process and polished the story to what it is. And thank you to Mark Bulahao, who captured Widow Zamorra and her family, and the frayle in his gorgeous art. Usok # 2: I can has release date?